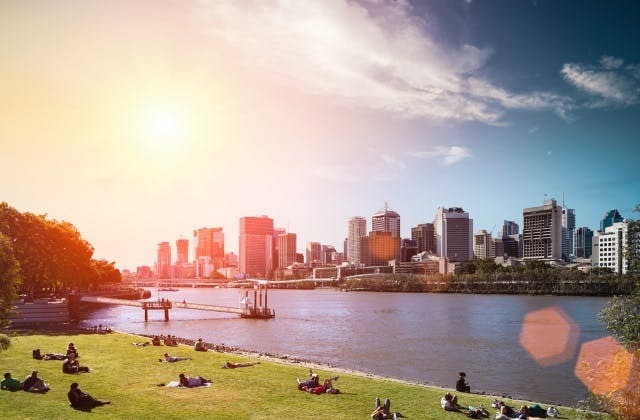 The booming city of Brisbane, or ‘Bris Vegas’ as the locals like to call it, is a river town abuzz with the pother of paddle steamers and ferries meandering along the Brisbane River, the bustle of a blossoming arts scene, and the clamour of a thunderous nightlife. Fortitude Valley’s showgrounds have unmatched performances in store for you, and the Cultural Precinct goes out of its way to put together an engaging exhibition, a Broadway show or a momentous theatre show. Girdled by the D’Aguilar and Lamington national parks, with its countless islets rolling into the hinterlands of the Sunshine Coast to the North and Gold Coast to the South, the port city of Brisbane looks across Moreton and Deception Bay onto a chain of low-lying islands. Moreton Bay stirs the golden beaches of Tangalooma, while bales of turtles or pods of whales and dolphins surface every now and then to be fed amidst the stirs and wobbles of a fleet of yachts. Airstrips and a helipad are the gateway to Moreton Island, and the means by which tourists return to the redolence of strong coffee on the South Bank. Mingle with locals at the market, take in the live performances, and soak up some sun on the only inner-city beach in the whole of the continent. Brisbanites enjoy a plethora of entertainment and outdoor adventure choices that only a subtropical setting can offer. Abseil the cliffs of Kangaroo Point after running 107 steps to reach the peak, then follow the bikeway to the other riverside oasis that are the Brisbane City Botanic Gardens and enjoy alfresco dining at the Eagle Street Pier. When you’ve quenched your thirst and cleansed those thoroughly pampered palates with some bottled elixirs at the Granite Belt Wine Region, hike the peaks of the Scenic Rim. Rock climbing, kayaking, swimming and cycling are all in a day’s work for the blessed people who go to sleep knowing they’ll wake up in Brisbane tomorrow. Feel the city come alive with each new dawn in this bookshop, restaurant and bar laden, understated and laid-back capital of the world. The cheapest airfare from Adelaide to Brisbane is $68. The UTC/GMT offset for Brisbane is 36000.